Explosives for demolition works, primering, smooth excavation, etc. The plastic explosive for special use called SEMTEX® 1A is an explosive based on a non-explosive plasticiser with the active component pentrite. The explosive contains a colour substance for pre-explosion detection. It is used for demolition works, under water blasting works (to 100 m), special blasting works and as a primer. The explosive can be separated and shaped under the conditions listed in its instruction manual. The plastic explosive for special use called SEMTEX® 1H is an explosive based on a non-explosive plasticiser with the active components pentrite and hexogen. The explosive contains a colour substance for pre-explosion detection. It is used for demolition works, under water blasting works (to 100 m) and special blasting works. It is an explosive of SEMTEX® type with the highest detonation velocity. The explosive can be separated and shaped under the conditions listed in its instruction manual. The plastic explosive for special use called SEMTEX® 10 is an explosive based on a non-explosive plasticiser with the active component pentrite. The explosive contains a colour substance for pre-explosion detection. It is used for special demolition and blasting works, and under water blasting works (to 100 m of water column). The explosive of black colour is easy to shape with good adhesion. The explosive can be separated and shaped under the conditions listed in its instruction manual. The plastic explosive for special use called SEMTEX® 10-SE is an explosive based on a non-explosive plasticiser with the active component pentrite. The explosive contains a colour substance for pre-explosion detection. It is used for blasting reinforcement of metal materials. The explosive of white colour is easy to shape with good adhesion, in the shape of a leaf cartridge. The explosive can be separated and shaped under the conditions listed in its instruction manual. SEMTEX® 90 is a plastic explosive for special use on the basis of an inexplosive plasticizer with penthrite and hexogene as a active components. The explosive contains a marking substance for pre-explosive detection. It is used primarily for destruction works, underwater blasting works (up to 100 m of water column) and special blasting works. The explosive can be split and shaped under the conditions indicated in the instruction manual for its use. Shelf life is 10 years. The plastic explosive for special use called SEMTEX® S 30 is an explosive based on a non-explosive plasticiser with the active component pentrite. It is used for blast cladding and metal welding. It is a white powdery substance. The explosive SEMTEX® 1A is wrapped in wax paper or PE hoses. The primer cartridges with a central groove are packed into paper tubular cases with plastic perforated caps for the detonator and the Cordtex. The explosives SEMTEX® 1H and SEMTEX® 10 are wrapped in wax paper or PE hoses. They are supplied in the form of bricks with the weights ranging from 250 to 3,000 g as per the customer requirement. 24 kg or 25 kg of the explosives are packed into one transport packaging. The explosive SEMTEX® 10-SE is delivered in the form of a leaf cartridge with the dimensions of 300 x 2 mm and with the length corresponding to 10 kg, i.e. approximately 10 m. The charge is covered with PE foil on both sides, or with silicone paper and coiled up. The powdery explosive SEMTEX® S 30 is wrapped into PE bags of 25 kg and put into transport packaging. 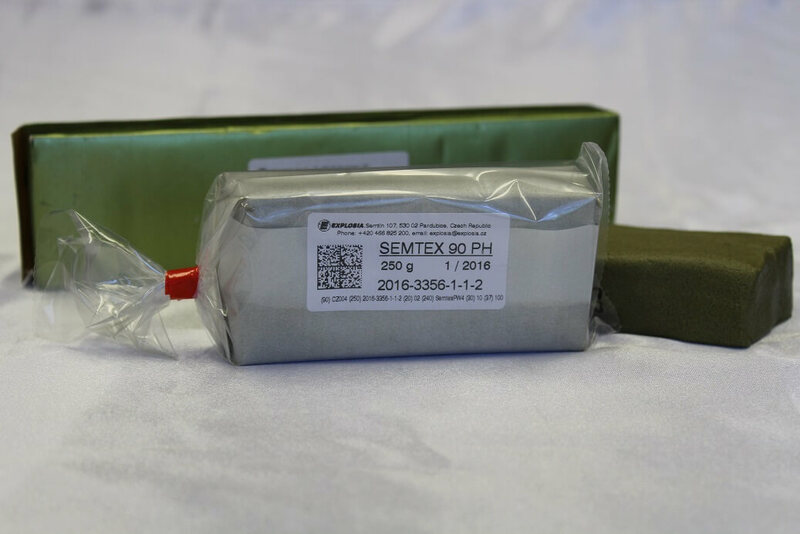 Semtex 90 is a plastic explosive based on a semi-active plasticiser and high-strength crystalline explosives of pentrite, hexogen, or their mixtures. The explosive shows excellent lifespan, water resistance and good plasticity within the thermal range from -40 °C up to +63 °C.